Regular size: 24cm,28cm,32cm.Also 20cm,40cm,50cm,60cm special size according to your requirment. 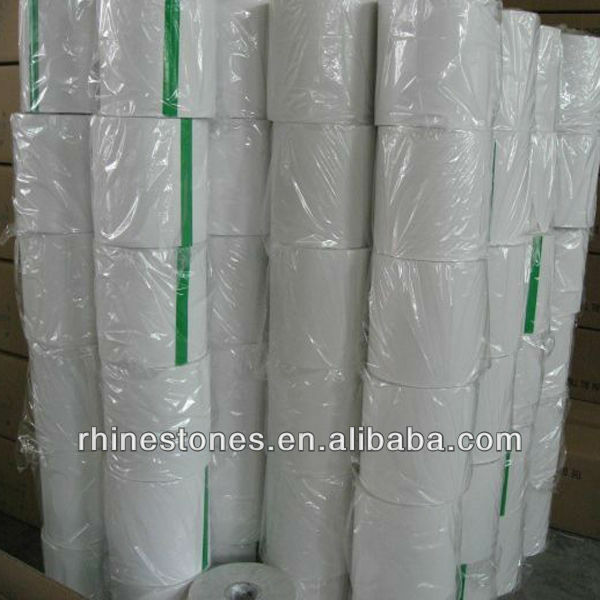 General package: 6 rolls/carton, 3 rolls/carton. 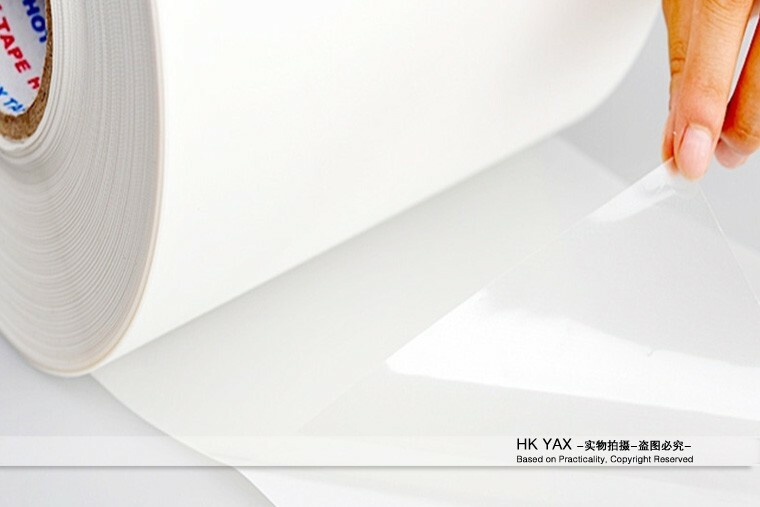 Usage: used with hot fix rhinestones,hot fix rhinestuds,nailhead,and other strass and metal stud,in making hot fix motifs,heat transfer motives.Hot fix tape is an indespensable material in making hot fix motifs. 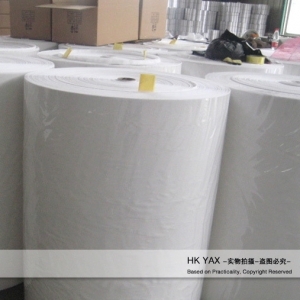 Delivery time: for orders under 100 box volume,ready goods available,shippment within 1 week( by sea),for orders 20feet,40feet,5 days production time,plus shipping handling time,totally around 12 days. Related product: heat transfer paper,laser paper,hot fix rhinestones,hot fix rhinestud,hot fix nailhead,hot fix half round. 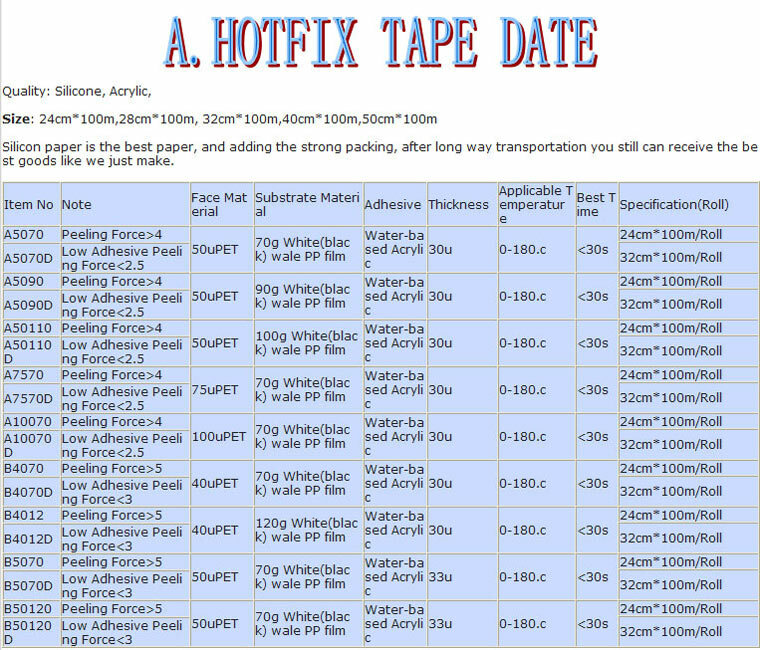 Hot fix tape ,hot fix transfer tapes ,hot fix silicion tape. 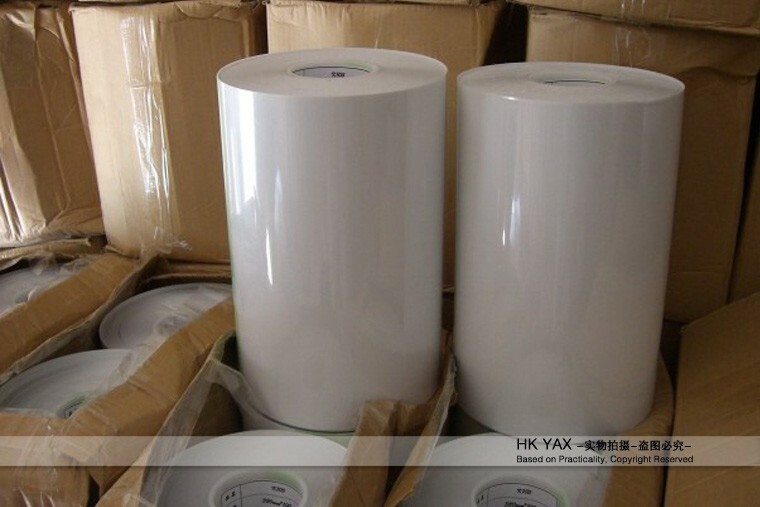 Hot fix tape has excellent resistance and adhesive power. 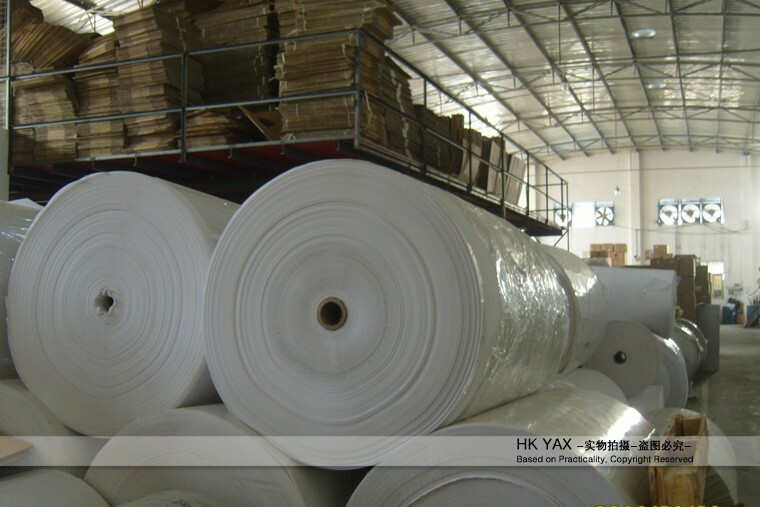 It's used for decoration of garments as fixing hot fix material on the cloth. We can offer both Acrylic adhesive hot fix tapes and Silicone adhesive hot fix tapes. 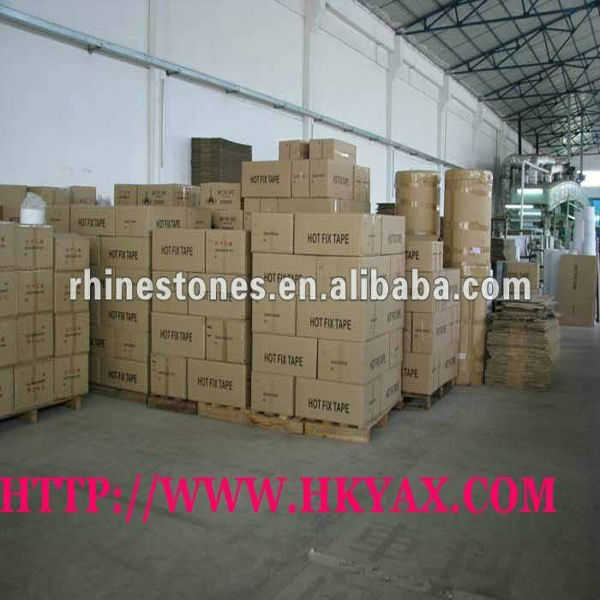 1.Widely used for various kinds of rhinestone heat transfer motif. 2.Offer free samples for you to check the quality . 3.Competitive low factory price . 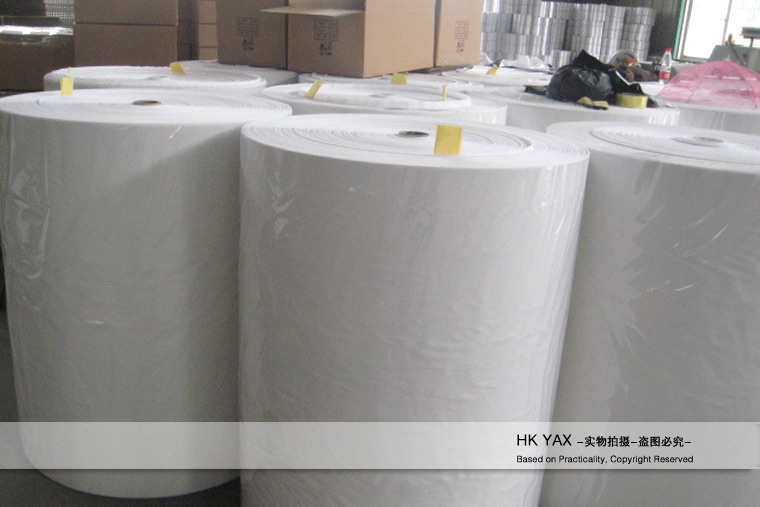 4.Strong supply capacity in bulk quantity. Hot fix tape are used for all kinds of hot-fix motifs. It is very easy to tear up after ironing, not sticking to the garment/dresses. Hot fix rhinestones stick firmly, and they do not move easily. Therefore, hot fix tape is the best choice for high-grade export hot-fix motifs. Samples are pleased to offer you for free as long as the shipping cost on clients' side.